Attack graph analysis has been established as a powerful tool for analyzing network vulnerability. 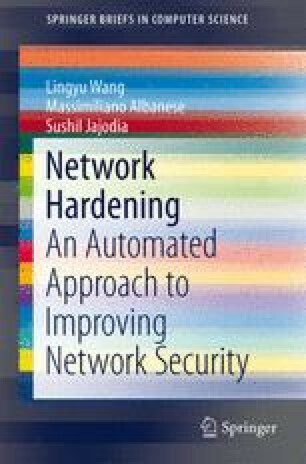 However, previous approaches to network hardening look for exact solutions and thus do not scale. Further, hardening elements have been treated independently, which is inappropriate for real environments. For example, the cost for patching many systems may be nearly the same as for patching a single one. Or patching a vulnerability may have the same effect as blocking traffic with a firewall, while blocking a port may deny legitimate service. By failing to account for such hardening interdependencies, the resulting recommendations can be unrealistic and far from optimal. Instead, we formalize the notion of hardening strategy in terms of allowable actions, and define a cost model that takes into account the impact of interdependent hardening actions. We also introduce a near-optimal approximation algorithm that scales linearly with the size of the graphs, which we validate experimentally.